The Dallas Cowboys have won five more games than last season, they are the No. 1 seed in the NFC, and more than likely they will have a first round bye in the playoffs. Still, even with all that, Jason Garrett’s squad has a one giant problem. Or more specific, the New York Giants. The Cowboys are 11-2 this season with both losses coming against their NFC East rival, in Week 1 and Week 14. Odds are the Cowboys will still win the NFC East, but don’t be surprised if these two squads meet up again in January, just like we saw in the 2007-08 season. That year the Cowboys were the No. 1 seed and the Giants squeaked in as a wild card team, later defeating the Tony Romo-led Cowboys. The Giants ability to eliminate Dez Bryant has been a huge factor. On 14 targets from Dak Prescott, Bryant has just two catches for 18 yards against the Giants. That’s a true testament towards Steve Spagnuolo defensive unit. The Cowboys explosive offense ranks top six in yards gained and points scored, but are averaging just 13 points per game against the Giants this season. We’ve seen this in the past many times before. Regardless of team records, sometimes there’s an excellent team that tends to struggle against another team with an inferior record. Even the almighty Seattle Seahawks struggle against the Los Angeles Rams. Dan Marino’s Miami Dolphins would lose so many games to the New York Jets even when the Dolphins were Super Bowl contenders. 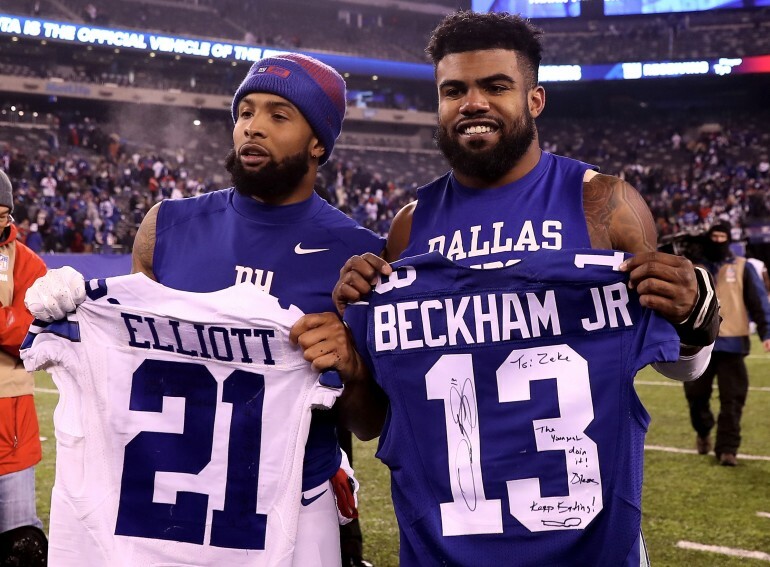 So what are the odds the Cowboys and Giants face one another in the playoffs? The Cowboys should get a bye week in the first round and the Giants will have to face either the No. 3 or No. 4 seed. It’s possible the Cowboys and Giants could face one another as early as the second round in the NFC postseason. If the Cowboys were to lose (thus being 0-3) to the Giants in the postseason, one could argue that Jason Garrett’s job security should be on the line. The Cowboys have been on both ends of the spectrum. As previously mentioned, they swept the Giants in 2007, but lost against them in the postseason. However, in 2009, the Cowboys swept the Philadelphia Eagles and they were able to defeat them come playoff time.